VINTAGE BEAU - HEY JULES! The Vintage Beau necklace is the perfect piece for those seeking modern femininity and classic sophistication for their wedding day. Barely-there jewellery wire holds a delicate mix of Swarovski cream pearls and dark silver-grey crystals which catch the light as you move. This piece is perfect for a strapless gown and makes a lovely focal point with the drop design. Why not have this as a backache? MADE TO ORDER – The Vintage Beau Necklace is custom made to order. 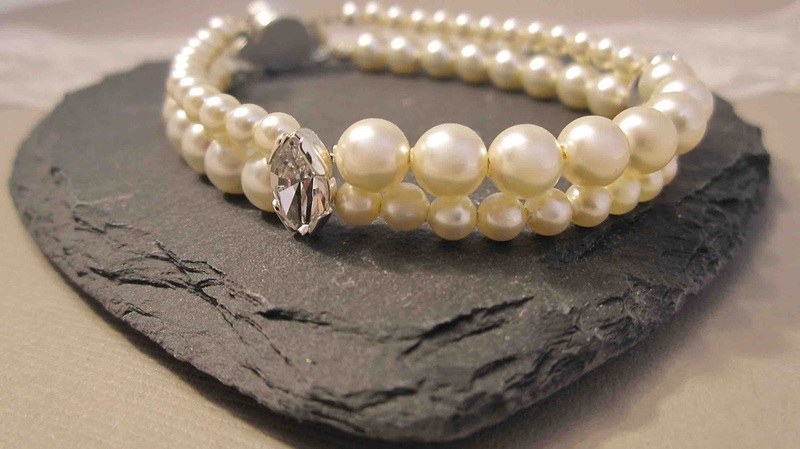 This design can be customised by using different pearls and crystal, or by having the whole loop beaded. DIMENSIONS – You choose the length to suit your wedding gown. The Vintage Beau earrings are the perfect accessory for those seeking modern femininity and classic sophistication for their wedding day. Barely-there jewellery wire holds a delicate mix of Swarovski cream pearls and dark silver-grey crystals which catch the light as you move. This piece is perfect for a strapless gown and looks fab on their own or with the matching necklace. MADE TO ORDER – The Vintage Beau earrings are custom made to order. 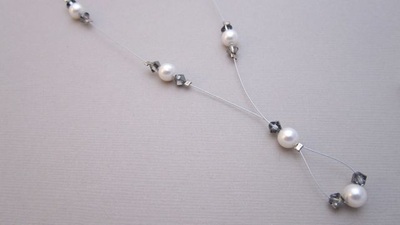 This design can be customised by using different pearls and crystal, or by having the whole loop beaded.